As a young person, there’s nothing less empowering than listening to an older person tell you how real activism was done in the 1960s. Climate justice activists protest the Dakota Access pipeline outside the White House in February 2017. Credit: Flickr/Stephen Melkisethian. CC BY-NC-ND 2.0. On March 24 2018 I stood in the rain in front of City Hall in Bellingham, Washington with some 3,000 people for the local March for Our Lives demonstration. It was one of 800 similar events happening nationwide that day, with about two million people participating coast to coast. The March for Our Lives against gun violence is one example of the wave of massive demonstrations that have swept the country since the Trump administration took office. From the Women’s March, to responses to Trump’s attacks on Muslims and immigrants, to protests against police violence, rallies for healthcare, and uprisings against pipelines, the last two years have been characterized by mass movements unparalleled in the United States in decades. Many, like the March for Our Lives, involve young people in leading roles. As someone who spent most of the past decade as a “youth activist”—in my case, a climate activist—I’ve been waiting for this moment for a long time. I became an activist while attending Portland Community College at age 17 in 2005. Inspired by a political science professor who discussed social movements in class, I researched projects like the Campus Climate Challenge, a campaign to pressure school administrations to curb campus carbon emissions. I got involved in pushing for recycling at my college. Fast forward a couple years to when Energy Action Coalition organized Power Shift 2007, a gathering of about 5,000 students in Washington, D.C. that included a multi-day organizing conference and a rally at the Capitol. At the time, it was the largest-ever demonstration for climate action in the United States. For many of us, this stands out as the moment the “youth climate movement” became a distinct force in progressive politics. I didn’t make it to Power Shift 2007. But I was in D.C. in 2009 for the next Power Shift, an even larger gathering of some 12,000 youth. Then a senior at Oregon’s Pacific University, I convinced three classmates to fly across the country with me. A lot has changed since those early years of youth climate activism. For one thing, many of us who got involved then are no longer “youth”—I recently turned 30. More importantly, the movement has grown in remarkable, unexpected ways, overlapping with other progressive organizing efforts. Indeed, my sense is that there’s no longer a distinct “youth climate movement” the way there was in 2009. It’s become several movements—for fossil fuel divestment, opposition to pipelines and solidarity with indigenous nations. Another way of looking at it is youth climate activists are just one part of a much larger coalition of progressive movements that simply didn’t exist on this scale 10 years ago. For almost exactly a decade, I identified as a youth climate activist. After graduating from Pacific University in 2009 I volunteered for the Sierra Club’s Beyond Coal Campaign, focusing on involving college students in the effort to close Oregon’s only coal-fired power plant. In 2011 I moved to Missoula, Montana and spent four years rallying students and others to oppose coal export and mining projects. These last few years I’ve made a transition to supporting the growth and leadership of a new generation of young activists working on climate change or other issues. Like all large movements, youth climate activism has had its successes and setbacks, its enormously inspiring moments and others when it failed to live up to its ideals. What follows are some reflections on lessons from the movement, necessarily limited by my own experience and position as a white male organizer from a middle-class background. Despite this bias, I hope these reflections may be of use to people involved in today’s fast-growing youth-led movements. 1. Trust in students’ abilities. One of the best things the youth climate movement did early was stop telling young people they were apathetic—as media figures like Thomas Friedman were doing—and start saying they were powerful and inspiring. Events like Power Shift promoted positive messages about the abilities of youth. This inspired many young people, including me, to think we could make a difference and try to do so. Still, some national groups have not fully realized this lesson, limiting their work with youth to voter turnout drives, trainings and large rallies. With some exceptions, large national groups have been more reluctant to trust students’ ability and willingness to engage in tactics like civil disobedience. I first got arrested at a protest when I was 23, at a sit-in I helped coordinate in the Montana State Capitol. I had studied the philosophy of nonviolent civil disobedience and concluded that this was a step I was ready to take. I was less sure my slightly younger peers, who possibly lacked this background, would be willing to do the same. Yet, over the next few years, I was pleasantly surprised to see students who’d only recently gotten involved in activism step forward and risk arrest blocking the paths of coal trains and sitting in at lawmakers’ offices. We tend to underestimate the ability of young people to intuitively grasp the significance of nonviolent direct action as a strategy. Of course, the opportunity to engage in this kind of activism must be presented in a way that feels accessible and meaningful—but when this is done, youth will step up. Have faith in their abilities. 2. Follow-up is hugely important. Building a sustained movement means following up with those who participate to ensure they stay involved. A campaign that failed to do this well was Power Vote in 2008, a national multi-organization effort focused on getting students to pledge to vote ahead of the election. I was the campus lead for Power Vote at Pacific University and only later realized the flaws in how the national campaign was structured. We gathered hundreds of pledge cards with students’ contact information—but this valuable data wasn’t collated in a timely manner that would have allowed it to be used for following-up. Follow-up is important in all campaigns, not just those with students. But it can be especially important for young people who are mostly new to political engagement. Following up and reminding students to fill out their ballots, show up to the next rally, and contact their elected officials helps build habits that will likely keep for years—but it requires mechanisms to ensure their data is preserved and used. The best activism serves two purposes: It accomplishes a campaign objective while helping participants master skills they can put to use in other contexts. This is especially important with young people, who often have little formal activist training but can take what they learn and apply it again and again. Many activist skills—setting up meetings with public officials, testifying at hearings, holding nonviolence trainings—aren’t actually that complicated but can seem vastly mysterious to someone who has never done them before. Once armed with the right knowledge, young people become empowered to transfer skills to new campaigns and situations. Accomplishing this means structuring movements in such a way that youth have leadership roles and get hands-on experience building campaigns from the ground up. 4. Be specific about movement goals. When I got involved in climate activism, we talked a lot about “comprehensive climate legislation” and “creating green jobs.” This sounded great, but it was sometimes unclear exactly what these words meant. This came back to bite the movement in 2009-2010, during the fight over national climate legislation that eventually went down in flames. The problem with vague terms like “comprehensive legislation” is they mean many things to many people. As it turned out, to lawmakers—like then-Sen. John Kerry and Sen. Lindsay Graham—they meant a cap-and-trade plan riddled with loopholes and giveaways to polluters. This truly terrible piece of legislation split the climate movement—including youth activists—between those who saw it as a small step forward, and those who believed it was worse than nothing. On the other hand, the campaigns that have done most to strengthen the climate movement have very specific goals tied to clearly defined strategies. These include efforts to stop oil pipelines, close coal plants and divest universities from fossil fuels. These campaigns have accomplished concrete wins while building coalitions that leave the movement stronger—whereas the push for national legislation left climate groups fragmented and demoralized. 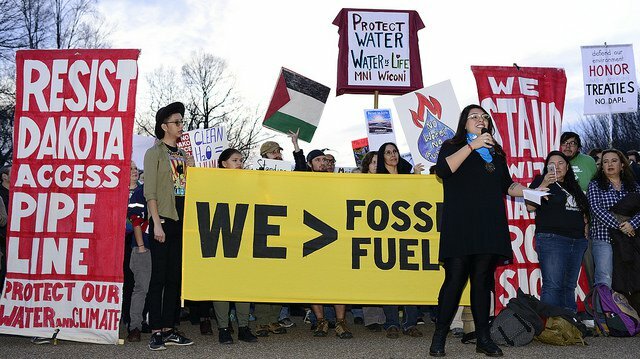 Fossil fuel divestment is a particularly good example of a student-focused campaign with an easily understood goal and clear framework for building power. 5. Partner with frontline communities. Not only is this the right thing to do, but it’s strategic, fun and empowering. Some of the most inspiring moments I can think of from youth climate campaigns involved students interacting with people on the frontlines of extraction and polluting industries. I’ve seen student activists collaborate with farmers impacted by natural gas pipelines, residents of working-class rail line neighborhoods affected by coal trains and indigenous groups fighting oil infrastructure. In each case, the partnerships that developed were (I believe) mutually rewarding for both groups. That said, building effective, lasting partnerships with frontline communities takes work. It’s not just about saying the words “people of color” and “climate justice” in every press release. This kind of work requires commitment to lasting relationships built on good faith and the belief in a shared stake in a better future. It requires learning form the people most affected by pollution so as to challenge fossil fuel industries effectively. 6. Partner with older activists. Another of the most empowering experiences youth activists can have is the opportunity to work with no-longer-quite-so-young individuals who have a whole different set of life experiences. For students, it can be heartening to see that their generation isn’t the only one concerned about the status quo. Similarly, non-youth activists tend to find it encouraging to see young people rising to build a movement. This doesn’t mean student and older activist groups should merge. There’s real value in youth-specific organizations that let young people bond and learn from their peers in a familiar setting. Different activist generations also tend to have different organizational cultures, which don’t always mesh well in the meeting room. However, none of this prevents youth and non-youth from collaborating on campaigns, attending each other’s events and building strong alliances. I’ve seen college freshmen and retirees sit down for campaign conversations that were eye-opening for both parties. 7. Have hard conversations about equity and inclusion. From the movement’s early days, national youth climate organizations have used a lot of language about racial and economic justice. This positive language hasn’t always been supported by the kind of on-the-ground organizing needed to truly combat environmental injustice and oppressive hierarchies embedded in the movement itself. The mainstream climate movement and environmentalism generally continue to be overwhelmingly white middle-class affairs. But today’s students seem more ready than ever to have tough conversations about dismantling racism and deconstructing environmentalism’s Euro-centric dominant narratives. As a white teenager, I wasn’t asking the kinds of questions that I should have been about these subjects—and I’m continually impressed by how much more aware today’s students, including white students, tend to be. This isn’t to say white students don’t have a lot of hard work to do to address the implications of their privilege—and some will do it clumsily, especially at first. However, while the hard work remains to be done, I see a willingness to begin it that seems more widespread than it was 10 years ago. To do this work effectively, students need support from mentors and organizations that are committed to equity and inclusion as much more than catchphrases or boxes to be checked. 8. Youth need mentors, not sages. As a young person, there’s nothing less empowering than listening to an older person tell you how real activism was done in the good old ‘60s (or the ‘90s, ‘00s, etc.). Young people don’t need sages telling them what to do. What they can use are mentors—people who’ve left their 20s behind and have experience and knowledge they’re willing to share, but do so humbly and with the realization that youth also have their own knowledge and skills to share. As a student, I was never particularly motivated by the argument that because the generation before mine screwed up, it was my generation’s job to fix things. I wanted to know, since that older generation was still around, why they couldn’t pitch in and help. I’ve also known many, many older activists who have tried to help in just this way, and taught me things I never could have learned by myself. The “youth climate movement” of today looks very different from the one of 2007. To become more effective it has both narrowed and broadened its focus. The narrowing is a result of it zeroing in on winnable campaigns like divestment and stopping pipelines, while the broadening is due to a growing focus on building bridges with other movements. Done effectively, both of these approaches may succeed in generating the kinds of incremental wins that could cascade into a national wave of climate and progressive victories. I’m deeply humbled by campaigns like the March for Our Lives, which succeeded in building a truly massive youth-led movement in a way climate activists of my generation never quite managed to do. Yet, when 5,000 students came together for the first Power Shift in 2007, few movements were prioritizing youth leadership the way climate organizers were. The story of youth activism these last 10-plus years has been one of gradually building power, learning hard lessons and setting examples of what dedicated organizing looks like. The climate movement made a significant contribution to this process. Without the work of climate and other youth activists over the last decade, some of the larger mass movements of today might not have come into being. What will youth climate activism, and young people’s organizing more generally, look like over the next 10 years? I don’t know, but I look forward to finding out.